I’m so glad I finally pulled the book Food from Many Greek Kitchens out of my to-read stack. This is the latest from Tessa Kiros, and I received a review copy. I was charmed by the photos of life in Greece interspersed among the recipes and food photos. And, I was delighted by the number of vegetable and vegetarian dishes like the Wild Greens Pie, the White Bean Soup, Baked Okra, Beets with Yogurt and Pistachios, and Stuffed Tomatoes to name a few. Seeing the Saganaki recipe brought a smile to my face because it reminded me of my first dinner date with Kurt, and the fresh fish dishes made me want to book a flight to Greece to take in the view of the coast while enjoying the local seafood. The content is organized in a unique way too. 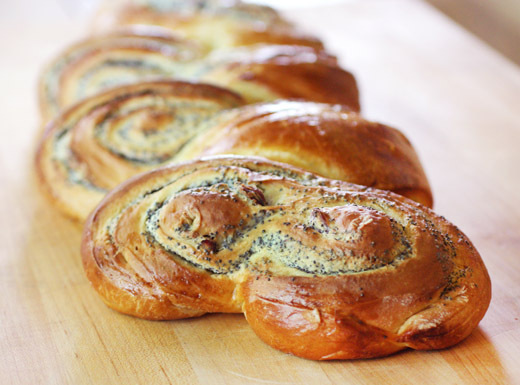 Traditional foods appear in Chapter One, and those are the recipes that are typically included in celebrations like Vassilopitta or New Year Wish Cake and Baklava. Chapter Two is Fasting Foods, and these are recipes with no meat other than seafood, which of course appeals to me, and no eggs or dairy like Pureed Yellow Split Peas which I’ll return to soon. The other chapters are Easter Foods, Shared Foods, Baker’s Foods, Soups, Ladera and Salads, Ready-Cooked Foods which are slowly baked or roasted and made in advance, Then and There Foods which are quickly grilled or fried dishes, and Sweet Foods. I bookmarked several pages, and immediately wrote a shopping list. One of the first dishes I tried was Tirokafteri or Spicy Feta which is a puree of roasted green chiles, garlic, olive oil, and feta cheese. It was fantastic with warm pita and olives as part of a meze. Next, I made the Baked Giant Butter Beans because I can never resist giant beans. After boiling the beans until cooked through, they were then baked with a cooked sauce of canned tomatoes, onion, garlic, parsley, and thyme. The beans became meltingly tender and full of flavor from the sauce, and it was a filling vegetarian stew. The third dish I tried, and the one I want to tell you all about today, was the Baked Stuffed Vine Leaves. 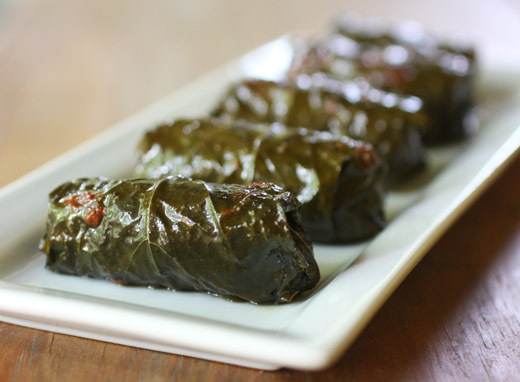 I was intrigued by this because both the filling and cooking process were a little unusual for dolmades. The filling was a mix of rice and shredded vegetables including onion, mushrooms, carrot, and zucchini. The grated vegetables were cooked in olive oil with the rice, and grated fresh tomato should have been added but I used canned diced tomato instead. 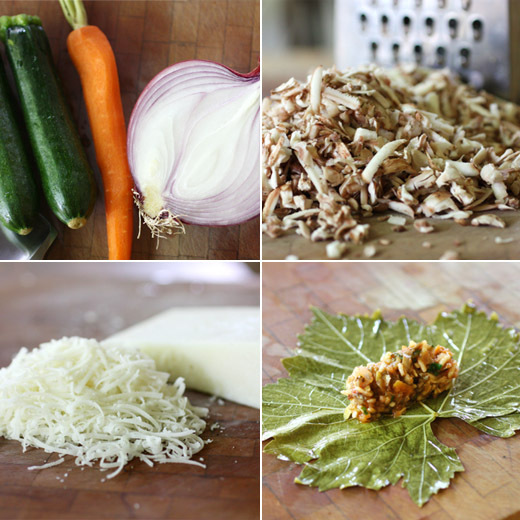 Parsley, mint, and lemon juice were added as well followed by grated kefalotiri cheese. Since I don’t have a vineyard nearby where I can snip leaves as needed, I used a jar of preserved vine leaves. I soaked the leaves in water and drained them before using. Spoonfuls of the filling were rolled into the vine leaves which were then packed into a large baking dish. Dolmades are usually steamed, but here, the dolmades in the baking dish were topped with more diced tomato, a cup of water, and a drizzle of olive oil before being covered with foil and placed in the oven for an hour. The foil was removed, and the dish was left to bake for another ten minutes. 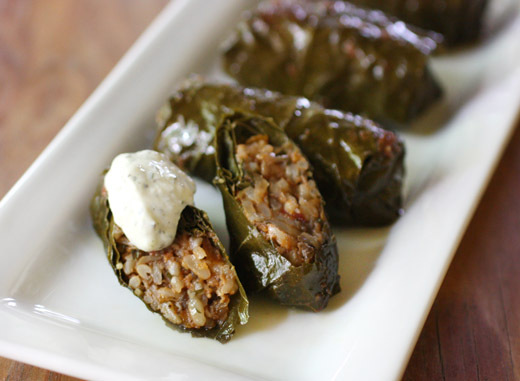 The dolmades were delicious warm from the oven with a dollop of tzatziki on top, and I also loved them cold from the refrigerator the next day. I’m used to dolmades from restaurants that have a filling of mostly rice, so the savory mix of vegetables here was much more interesting. Cooking from this book was as much fun as the daydreams it inspired about an eventual trip to Greece. 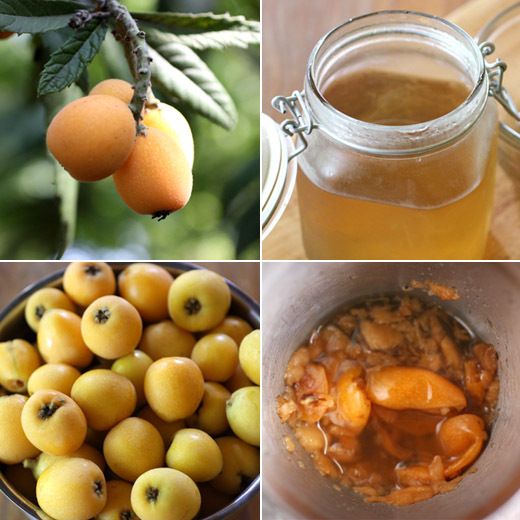 I want to tell you about loquats again because the first time I told the story, it was four years ago and I was probably the only person who read it. It's the story of how I didn't grow up with loquat trees, but I fell for them immediately after moving to Austin and seeing them everywhere. So, of course we planted a loquat tree in our backyard. Some years are better than others regarding how much fruit the tree produces, and some years are better than others regarding how many loquats the birds let me have. They're usually very fast to steal the fruit as soon as it ripens, but this was a good year and the tree was laden with enough fruit for me and the birds. Our tree is tall now, so I was standing on a ladder, holding a bowl, picking the little, orange fruits, and popping a few directly into my mouth when I remembered reading about the Loquacious in the book The American Cocktail . This drink was invented by David Alan, the Tipsy Texan, also from Austin, and it involves muddling seeded loquats in a cocktail shaker. Loquats have big seeds for their size, but the seeds slip right out when you cut the loquats in half. For some uses, you also need to peel loquats, but here they were just seeded and quartered. 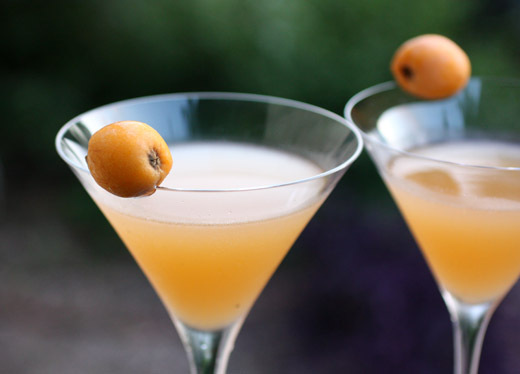 About six loquats were used per cocktail, and they were muddled in a cocktail shaker with some simple syrup. Vodka, preferably Tito's of course, limoncello or Paula's Texas Lemon, and I had some homemade limoncello on hand, lime juice, and ice were then added to the shaker. The cocktails were shaken and double-strained into chilled glasses. 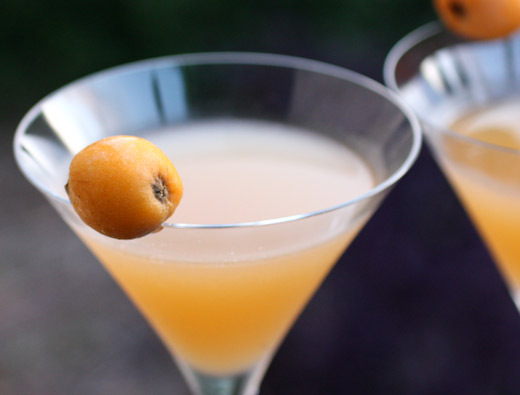 The flavor of loquats is like mild apricot, and the limoncello and lime juice accompanied it nicely. And, the pretty orange of the fruit gave the cocktail great color. Our tree has been picked clean of fruit for this year, and who knows if the birds will share next spring, but it was fun to toast the tree with a cocktail of its making while I could. I guess I’ve made it a tradition that I bake a somewhat elaborate breakfast bread for Easter. I can handle that so long as I find a recipe that’s just as good to attempt next year. 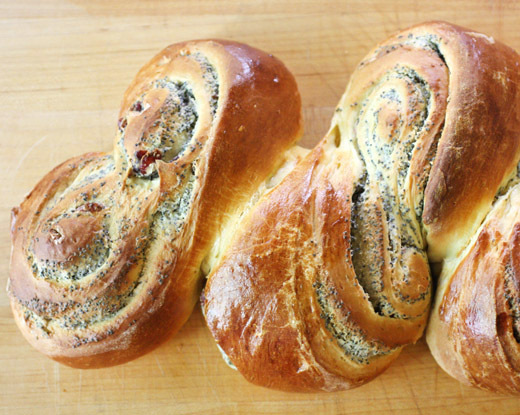 This year, it was a rolled and cut yeasted sweet bread dough filled with cream cheese mixed with poppy seeds and dried cranberries. The recipe is from an issue of Living magazine from several years ago. My best guess is that it appeared in the early 2000’s, and the recipe is not available online so I’ll include it below. The triple citrus part of the name comes from the orange juice as well as the lemon, orange, and lime zest that are included in the dough. The process for making this is exactly like making cinnamon rolls only rather than cutting individual rolls, the dough is only partially cut through and pieces are twisted out from the center. Now that I look back at my photos, I realize I could have done a better job of that twisting. Regardless of the direction of the twists and how the pieces land, it’s a fragrant and delicious coffee cake. The tender, buttery dough makes it easy to pull a piece off the finished loaf, and the flavors will have you pulling at a second piece soon enough. This breakfast bread or coffee cake is actually pretty simple to prepare, you just have to allow the time for the dough to rise. Also, this recipe makes two loaves so you can either feed a crowd or store the second loaf in the freezer. To begin, active dry yeast was added to warm water in the bowl of a stand mixer. To that, orange juice, two eggs, more sugar, melted butter, citrus zests, and salt were added. Those ingredients were mixed with a dough hook, and five cups of flour were added one cup at a time while mixing on low speed. The dough was turned out onto a floured surface and kneaded for a few minutes. It was then left to rise for about one and a half hours. 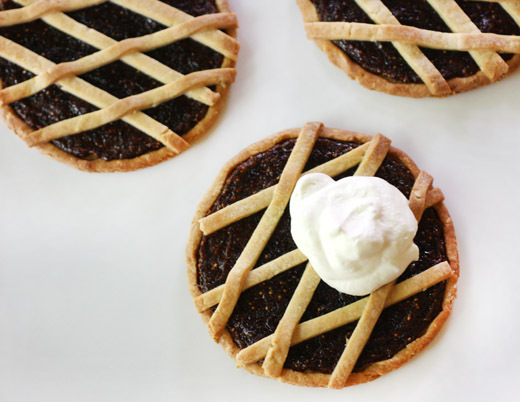 When the dough had risen, softened cream cheese was mixed with confectioner’s sugar, two egg yolks, and vanilla, and then poppy seeds and dried cranberries were added. Two baking sheets were lined with buttered parchment paper. The dough was cut in half, and one half at a time was rolled into a big rectangle. Each piece of dough was brushed with melted butter followed by the cream cheese mixture, and then each dough rectangle was rolled into a log. Each log of dough was placed on a prepared baking sheet. Then, each log was cut down one side about six or seven times along the length of the dough with the cuts spaced two inches apart. The cuts only went partially through the rolled dough. Each cut segment was turned to face cut-side up with every other segment being twisted to the opposite side. The cut and twisted loaves were covered with plastic wrap and left for a second rise for about 30 minutes. Before being baked, each loaf was brushed with egg wash. The dough turns a lovely golden brown as it bakes, and the citrus scent filled the kitchen. If the eggs and melted butter in the dough didn’t make it delicious enough on its own, the sweet cream cheese filling takes it up another level in decadence. This is a definite keeper, so I’ll eventually get better at making those twists in the dough. -In the bowl of a stand mixer fitted with the dough hook, place warm water and yeast. Mix to dissolve and let stand for a few minutes until foamy. Add orange juice, two whole eggs, the granulated sugar, 1/2 cup of the melted butter, the citrus zests, and salt. Mix until combined. On low speed, slowly add the flour one cup at a time, and mix until the dough begins to pull away from the sides of the bowl. -Turn the dough out onto a floured surface and knead until smooth. Spray a large bowl with spray oil and transfer the dough to the bowl. Cover the bowl with plastic wrap and leave the dough to rise for about an hour and a half or until doubled in size. -When the dough is almost finished rising, add the cream cheese, confectioners’ sugar, egg yolks, and vanilla to a large mixing bowl and either stir together or mix with a hand mixer until smooth. 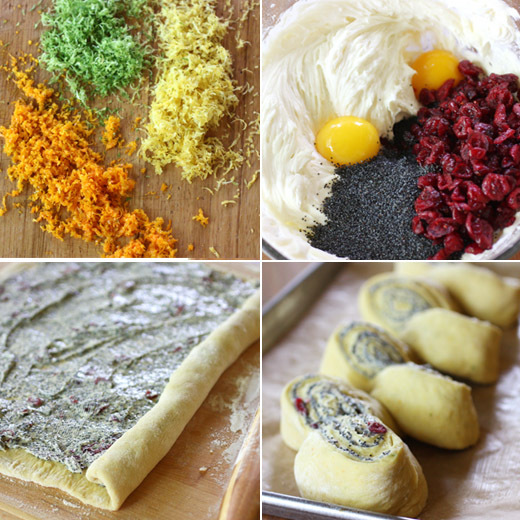 Stir in dried cranberries and poppy seeds until well combined. -Line two large baking sheets with parchment paper and brush the parchment paper with one tablespoon of melted butter. Divide the dough in half, and working with one half, roll it out on a floured surface into a rectangle about eleven inches by fifteen inches. Brush the dough with one tablespoon of melted butter. Spread half of the cream cheese mixture over the rectangle. Beginning on a long side of the rectangle, use your fingertips to roll the dough into a log, and pinch the seam to seal. Place the roll on one of the prepared baking sheets seam side down. Using a sharp knife, cut segments into the dough roll, along one side, at two-inch increments. The segments should only be cut three-quarters of the way through the width of the log. Pick up the first segment and turn it so it sits cut-side up. Lift and twist the second segment so it sits cut-side up on the opposite side of the roll. Repeat with alternating segments along the roll of dough. Then, repeat rolling, filling, and cutting with second piece of dough. -Loosely cover each loaf with plastic wrap and set them aside to rise for about 30 minutes. Meanwhile, pre-heat oven to 350 degrees F. Uncover the loaves and brush the dough only with egg wash. Bake for about 30 to 40 minutes, rotating baking sheets front to back and switching bottom pan to top and top to bottom in the oven after 15 minutes. Let cool before slicing or simply pulling pieces from the loaves. There's only one way to keep food traditions alive, and that is by cooking. 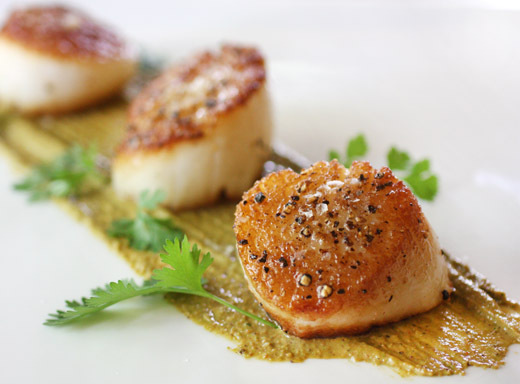 I was taken in by the following quote from Rustica: A Return to Spanish Home Cooking : "we cooks are simply the vehicles for these dishes to take shape. Without us they would simply remain ideas or words on a page--so whenever we cook these recipes, we invoke the idea of the food itself." This is the latest book from Frank Camorra of which I received a review copy. The goal of the book is to preserve the traditional dishes of Spain where the food ranges from simple, resourceful cooking to postmodernist art on a plate. Camorra set out to gather simple dishes that are "the foundations of Spanish food" and that still fit with the way people eat today. The recipes are mostly from home cooks with a few tapas or pintxos usually found in bars. The chapters are organized by topic or region, and my favorite was Las Huertas or The Kitchen Gardens. Huertas are found all across Spain, and they are small plots where families can grow most of their own food. There are simple vegetable dishes like Green Beans with Garlic Confit and Summer Chickpea Cream with Ripe Tomatoes along with heartier stews as well as desserts like the Red and White Cherries with Fresh Goat's Curd Ice Cream. The other chapters cover dishes with jamon, recipes for preserving vegetables, fish, and fruit, coastal specialties, Basque cooking, cooking over fire with wood or coals, and the Moorish legacy of food from Andalusia. Throughout each section, along with the beautiful photos, there are stories about cooks, markets, ingredients, traditions and more that help to paint the picture of all that Spanish food is. To get cooking, I started with Las Huertas chapter and a dish that's intended to stretch a special ingredient for several people to enjoy. 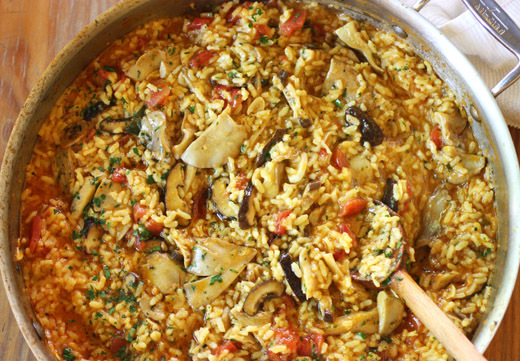 That special ingredient in this case is a wild mushroom known as trompetas de la muerte, and by cooking the mushrooms with rice you end up with a generous-size paella of sorts. Of course, I wasn't able to find this exact type of mushroom, and really wild mushrooms aren't that easy to come by here, but I did bring home some locally cultivated oyster mushrooms and shitakes. I also just happened to have some Bomba rice in the pantry, and this was a perfect time to use it. The dish is prepared like paella by first cooking onion, garlic, and herbs with saffron before adding some wine and then tomatoes. I used canned, diced tomatoes rather than the fresh ones that would have been flavorless right now. Next, some stock was added followed by the rice. In a separate pan, the mushrooms were sauteed with more garlic and some parsley. After the rice was cooked until tender, the mushrooms were added to it, and it was left to sit for a few minutes before serving. The rice picked up all the flavors from the onion, garlic, wine, and saffron, and even though the mushrooms I used weren't specially foraged wild ones, they were still a great match with the rice. I'm easy to please with the saffron, pimenton, seafood, and sherry that are all a part of Spanish food. And, I'm happy to keep cooking to help continue food traditions. 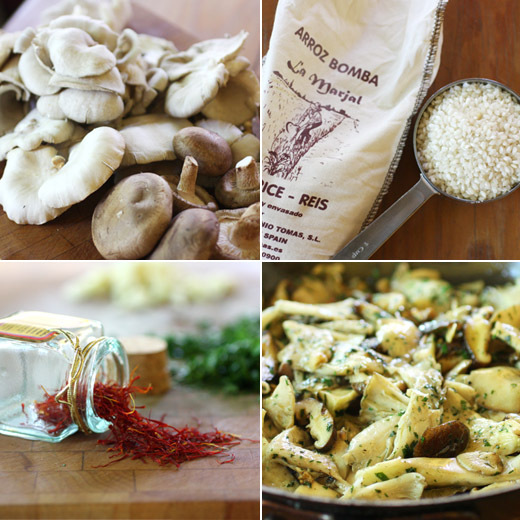 Recipe re-printed with publisher's permission from Rustica: A Return to Spanish Home Cooking . When you have something good and you want to share it around, but there’s not enough for a big piece for everyone, the Spanish answer is to put it in a soup or a rice dish. 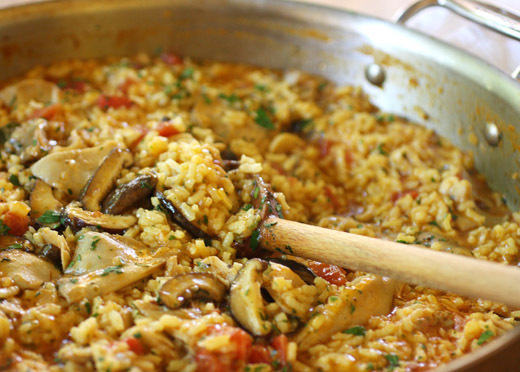 Time and time again, right across Spain, there are rice dishes that somehow champion the guest ingredient without detracting from the integrity of the rice. The champion in this case is a wild mushroom called trompetas de la muerte (trumpets of death). These mushrooms are so named not because they herald the demise of the ingestor but because they are black and look like little trumpets! Heat half of the olive oil in a perol or frying pan over mediumhigh heat. Add the saffron and stir for 30 seconds, then add the onion and 1/2 teaspoon of the sea salt and cook for 5 minutes, stirring occasionally. Add half of the sliced garlic cloves, all of the thyme and bay leaves and cook, stirring occasionally, for another 5 minutes, or until the garlic is soft. Increase the heat to high, then add the wine and boil for 2 minutes. Reduce the heat to medium, add the tomatoes and cook for 10 minutes, or until the tomatoes have reduced and thickened. Add the stock and bring to a boil, then stir in the rice and remaining 1 1/2 teaspoons sea salt. Reduce the heat to medium-low and simmer very gently, stirring occasionally, for 20 minutes. Meanwhile, heat the butter and the remaining olive oil in a frying pan over medium heat. Add the remaining sliced garlic and the parsley and sauté for 2 to 3 minutes, or until the garlic is lightly browned. Add the mushrooms, season to taste and sauté for 5 minutes, or until tender. When the rice has been cooking for 20 minutes and is tender, stir in the mushrooms. Remove from the heat and allow to stand for 10 minutes before serving. I remember the day Wednesday June 2, 2010 like it was yesterday. Ok, that might be stretching the truth, but I do remember the day the video of Yotam Ottolenghi making this ravioli was posted on the The Guardian site. I just looked it up, and that day was June 2, 2010. I remember watching that video and thinking that I couldn't wait to make this. It was a few months later when I acquired a copy of the book Plenty , where the recipe also appears, and then I couldn't wait to make everything else in the book too. 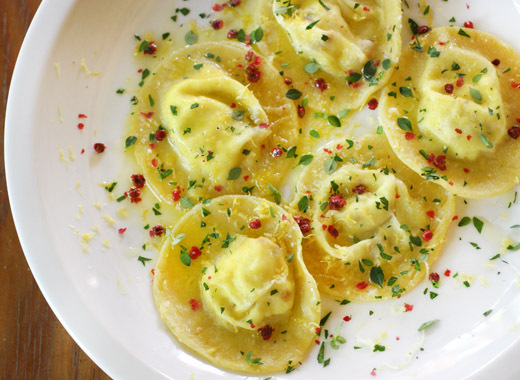 In the video, Ottolenghi calls the ravioli "little sunshines on the plate." And, they are. 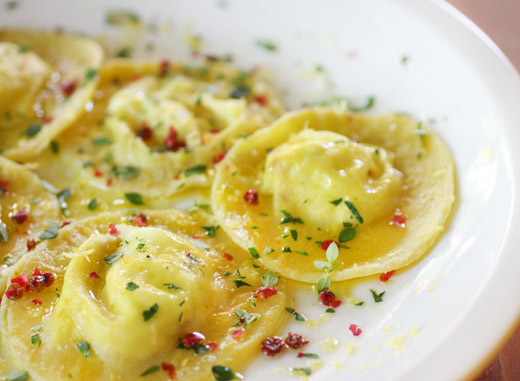 The lemony pasta with zest mixed into the dough, the fresh and tangy goat cheese filling, and the pop of pink and mildly spicy flavor from the peppercorns make the ravioli bright and springy. As I always say, making fresh pasta is one of my favorite kitchen tasks, and this time was no different. Since making pasta is one of my favorite things, of course, I have my preferred way of doing it. I never used a food processor, and I never make a well out of a pile of flour on a work surface. I put the flour in a bowl, make a hole in the center, add the eggs, and mix with a fork. That way, I don't have egg running all over my counter, but I can feel the dough and decide if it needs more flour or not. For this pasta, the dry ingredients included flour, a little turmeric for added yellow in the dough, and lemon zest. Three whole eggs were added with three tablespoons of olive oil. The dough came together nicely, and it was divided into four pieces, each piece was flattened into a disk, wrapped in plastic wrap, and chilled for 30 minutes. Meanwhile, the filling was made by mixing together soft goat cheese, some sea salt, crushed red chile flakes, and black pepper. After the pasta dough had rested, one piece at a time was passed through a pasta machine several times while setting the rollers closer together after each pass. To streamline the process of filling and cutting the ravioli, I left half of each long piece of pasta dough intact. That half was brushed with egg wash and topped with dollops of goat cheese filling. The other half of each sheet was cut into circles about three inches wide. 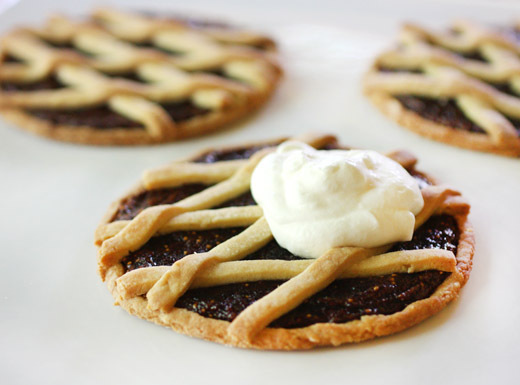 The circles were set over each dollop of filling, and then the cutter was used to separate each piece. Once cut, the edges of each were pinched to seal. You can cook the ravioli right away or cover and refrigerate them overnight. After boiling for a brief couple of minutes and draining, the ravioli were topped with crushed pink peppercorns, chopped parsley rather than tarragon in my case, more lemon zest and lemon juice, and some olive oil. 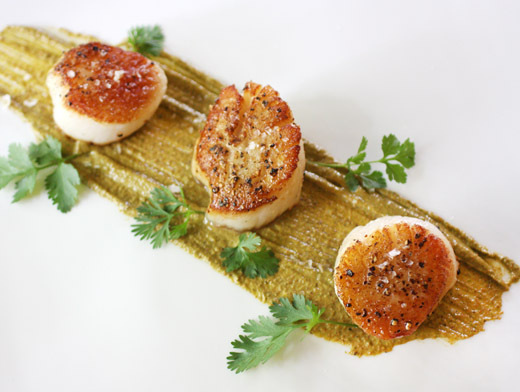 Each part of this dish is simple but just right. 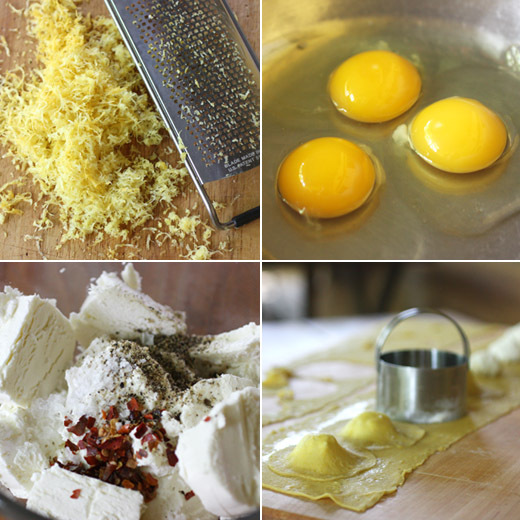 Pasta is plain by nature, but here it gets a boost from lemon zest. The filling was just a few ingredients added to goat cheese, and the toppings couldn't have been easier to add to each plate. But, all those simple parts resulted in something as fabulous as I knew it would be when I first saw the video. 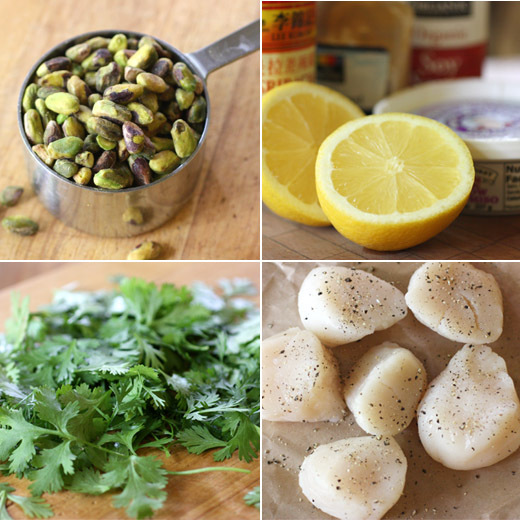 I have this one last citrus dish to sneak in here at the tail end of the season. This is from an article I cut from Delicious magazine two years ago, and the recipe is included on Taste.com. It’s one of those salads that look so pretty in the photo you know it’s going to taste great. I can’t help but be drawn to food like that. With several colors on a plate, there’s bound be a good mix of flavors as well. 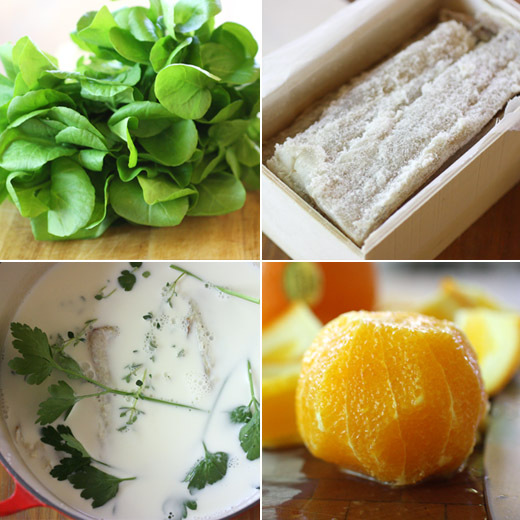 In this case, there are sweet, brightly-colored orange segments, briny and dark, black olives, pale and mild, soaked salt cod, peppery, pretty, green watercress, and some bite from skinny slices of red onion. I know some people fear that salt cod is going to be stinky or difficult to prep, but it really isn’t. I buy salt cod at Whole Foods that comes in a little wood box, and there’s no smell at all when it’s opened. I soak it in a bowl of cold water covered with plastic wrap that I leave in the refrigerator, and I change the water each day while soaking the fish for three days. The kind I buy is boneless and mostly skinless, so there’s very little work involved other than soaking. Once the salt is removed by soaking, the flavor is mild just like cooked fresh cod. So, you do have to plan ahead when working with salt cod since it does need to be soaked for two to three days to remove the salt. For this dish, after the salt cod had soaked for a few days, it was then simmered in milk with parsley sprigs, thyme, and bay leaves. After the milk with herbs and salt cod came to a boil, it was left to sit, off the heat, to infuse for about 15 minutes. Then, the fish was removed and chilled in the refrigerator. While the fish chilled, the vinaigrette was made with garlic, sherry vinegar, white wine vinegar, extra virgin olive oil, and orange juice. 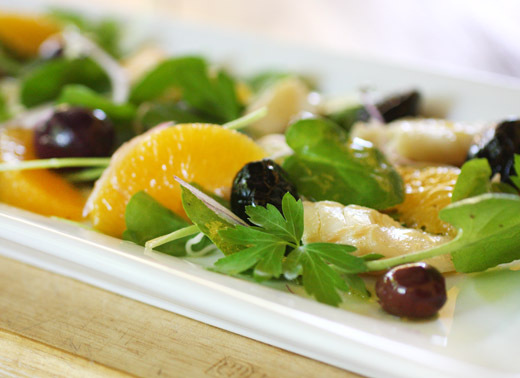 To build the salad, chunks of the salt cod, thinly sliced red onion, orange segments, black olives, and watercress were tossed with the vinaigrette and then plated with parsley leaves. A mix of black olives is suggested, and I used some oil-cured black olives, black picholines, and some kalamatas. 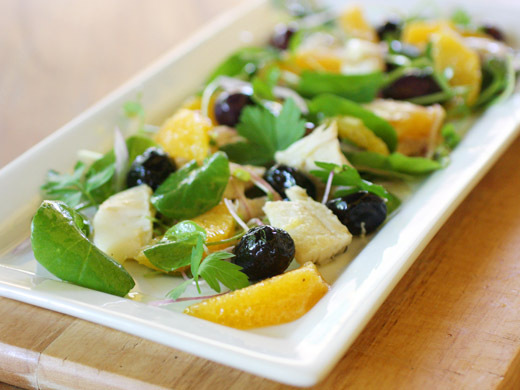 Oranges and black olives are a classic pairing, and that fruity and briny combination was a lovely thing with the chunks of cod and fresh watercress and parsley. You have a great dish when all the components’ flavors go together so well and everything looks so good together at the same time. The other day, I mentioned that my blog had just become four years old. During those four years, I’ve visited lots of other blogs and seen lots of fabulous food. I’ve always enjoyed reading about the results of the different baking and cooking groups that show dishes from Dorie Greenspan’s books. I never got around to joining the groups since I knew I’d somehow manage to miss every deadline for posts, but every time I see a dish chosen by the groups, I can’t wait to try it. I think about that every time I open one of Dorie’s books. 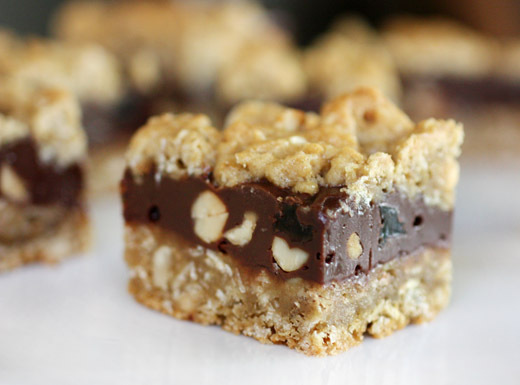 So, at last, I’ve baked the Chocolate-Oatmeal Almost Candy Bars from Baking: From My Home to Yours . Even though I’ve seen these bars on other blogs in the past, I didn’t quite realize what they're really like. These cookie bars are serious business. They’re crunchy, chewy, chocolaty, nutty, and delicious. Cutting these into small pieces is a good idea since they are filling, but I think they’re actually better than a candy bar. Dorie recommends serving them cold which keeps the layers firm, and I agree. 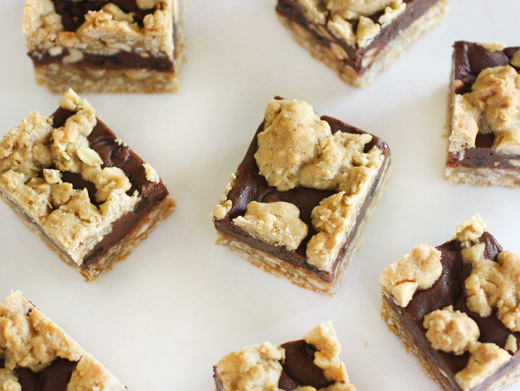 These bars are baked in a nine- by thirteen-inch baking pan, and the recipe makes a lot of cookies once they’re cut into small pieces. The bars can be frozen and thawed in the refrigerator. 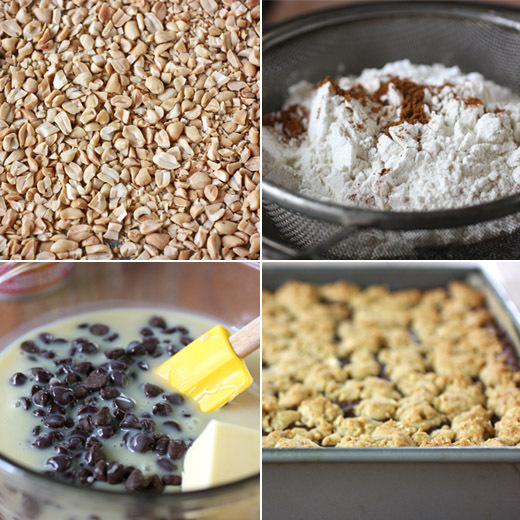 You start by making the oatmeal layer which becomes both the bottom surface and the crumble on top of the cookies. That’s made by creaming butter with brown sugar, then adding eggs and vanilla. Flour, baking soda, salt, and cinnamon are added next, and then oats and chopped peanuts are stirred into the dough. A couple of cups of dough are set aside, and the rest is pressed into the buttered baking pan. The chocolate layer was next, and that was made by melting chocolate chips with sweetened condensed milk, butter, and salt in the top of a double-boiler. 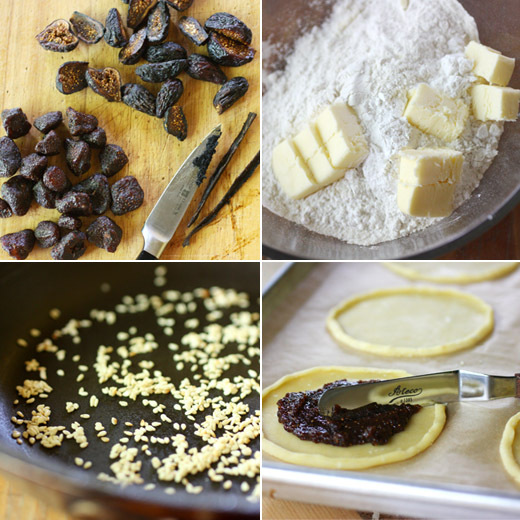 Once melted, vanilla, raisins, and peanuts were added. The chocolate mixture was poured over the oatmeal layer in the baking pan, and the remaining oatmeal dough was scattered on top. The bars baked for about 30 minutes, were cooled, and then refrigerated before cutting. It’s delightful knowing I have a stash of these bars in the freezer. They’re there for me any time I need a candy bar or cookie fix. They work for both kinds of cravings. And, when they run out, I’ll have to move on to something else I've read so much about over the last few years.